If writers were musicians, poets would not be the rock stars, the pop icons or the members of the symphony orchestra. In fact I doubt they’d even rate as mainstream among readers as jazz does among listeners. They’re pretty much to writing what indie bands are to music – autonomous, little known, more focused on producing their content than becoming wealthy or famous. Despite the generally cold shoulder of readers, we poets keep writing anyway because we love poetry and get some kind of strange fulfillment producing more of it (Billy Collins says it so well). For me poetry writing has flowed out of journaling. Sheila Bender’s book Writing Personal Poetry introduced me to contemporary verse. Canadian poet Nathan Harms and webmaster of Utmost Christian Writers website has been my mentor. Without his encouragement I would have given up writing poetry ages ago – I think. Although the yen to “build for the epiphanies of my life / little piles of words” would probably persist even if I were in solitary confinement and reduced to a pencil stub and the backs of envelopes. I hope you enjoy the poems and photos I’ve posted here. A few of the poems have been published elsewhere before, but most are on their first outing. 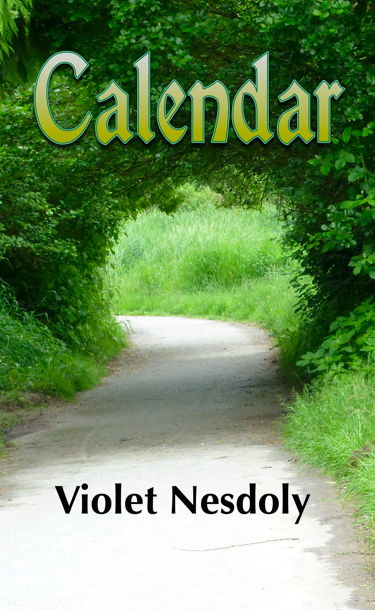 If you like them a lot you can get more of the same in my books (Calendar and Family Reunion). See the “Books” tab for ordering and downloading information. Happy reading – and thank you so much for coming by. Thought it would be fun to tell you that Karl and I visited Butchart Gardens in 1988. I still remember their beauty so well. I was also in Canada with my mother in 1972, to see Shakespeare plays and also Toronto. So much art from your country. Joni Mitchell inspired my writing too. The prairies and the rivers in her songs. A blessing to meet you through poetry and our blogs! Thanks, Ellen! I’ve been to Butchart Gardens twice – once many, many years ago, and last summer. For a flower-lover it is truly a thrilling, awe-inspiring place to visit. And isn’t the internet amazing – with its possibility to connect to people with similar interests?! I love it!! Am so enjoying your poems and perspectives. I have subscribed to your blog with Bloglines, so I come by regularly. Keep up the fine writing!! Violet, I am writing to you for inclusion in the Poetry Friday Round-Up this week. I have a poem with a message that is dear to my heart: education for the underprivileged. I would like you to consider placing it in the Round-Up and would be honored if you do so. I am new to the community and am delighted to be a part of the work of spreading the joy of writing. The poem is called My Eyes Speak and is part of my blog post, Creating Hope from Paper at http://beyondliteracylink.blogspot.com/2014/05/creating-hope-from-paper.html. Thank you for considering my poem for Poetry Friday. I am enjoying reading your thoughts.